Although I have no way of knowing for sure, or of proving my claim, but I'll bet I've been stung by more different species of scorpion than anyone else. Check out this list. It is by no means complete. I've been stung by scorpions that I can't identify past genus, so I have not included them here. If you can beat my list (or come even close), let me know! If anybody can match this list, then we'll have to compare lists for stings by the most different species of harvester ants (Pogonomyrmex). Kids, don't try this at home. I am a professional moron. When I get stung, it's usually because I'm doing something stupid with scorpions (like collecting them). I used to let myself be stung deliberately. I built up a pretty good immunity for a little while. 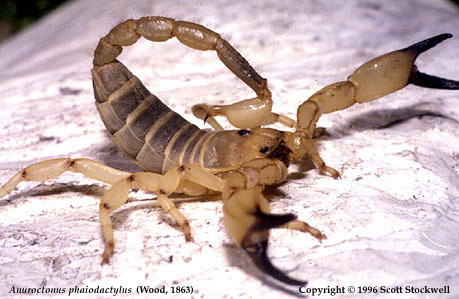 Now, I am hypersentized to scorpion venom, especially Centruroides. Worried about getting stung yourself? 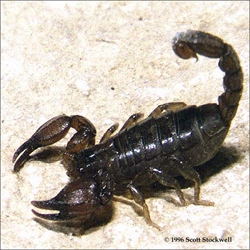 The Arizona Poison and Drug Information Center has a page on scorpion envenomation that covers signs and symptoms, and first aid. You might also want to read the page on scorpion venoms and stings.